Friends have been asking me how to pronounce Gračišće. It is quite a tongue-twister. So in case you were wondering, it’s pronounced Gratsch-eesh-che. Gračišće is a typical Istrian hilltop village, with many of its houses and buildings dating back to medieval times. At the time, these villages were fortified, encircled with high-walled ramparts and towers, with only one or two entrance gates. Today there’s one tower left and the main gate still stands and welcomes visitors into old Gračišće. Few people live in old Gračišće. Most young people here prefer to build their own houses and don’t see much value in the old stone houses which make up the village. Many newer houses have cropped up in ‘New Gračišće’, on the other side of the main road. There are also many smaller villages and hamlets scattered around the countryside which make up the larger municipality of Gračišće. The village stands at an elevation of 457 metres above sea level and offers stunning views of the surrounding countryside. Above: The spectacular view from behind the main church. Above: A view of Pićan, another neighbouring hilltop village. Gračišće has been going through a slow transformation over the past 20 years. 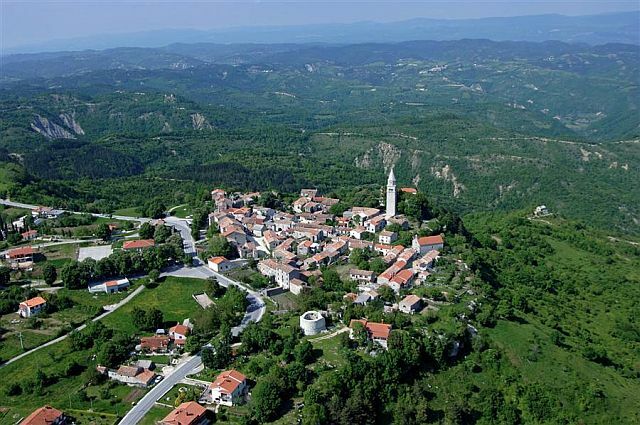 Like many other towns and villages across Istria, Gračišće’s population dwindled after most of its inhabitants started leaving after the Second World War and throughout the 50s and 60s, many migrating to other European countries like Italy and Germany or much further afield, to South America, North America and Australia. Many of the village’s dwellings stood abandoned and derelict, and many still are. But slowly its houses have been reclaimed, sold and bought, and renovated. Some have been converted into tourist accommodation. Gradually the village has been given a makeover and thanks to its cultural heritage status, the character of its houses and buildings cannot be altered and must be preserved (though there are a few aberrations here and there). Then more recently, the fine gravel which covered the squares, roads and lanes has been replaced with paving stones, giving the village an elegant finishing touch. As for the population, this seems to continue to decline as its residents get older and few young people want to invest in the renovation of an old house in an old village. Some of those who do, decide to rent their property out to tourists during the summer months and capitalise on Gračišće’s rustic charm. Wow, it's so picturesque and quaint... not to mention peaceful and pollution-free! I love it. This is amazing! Hope you have a wonderful time in Gračišće as you did in India. The first time I visited Croatia was a furniture moving job from the old walled town of Buzet to lake Balaton in Hungary. It looks like Buzet is not too far from your village. 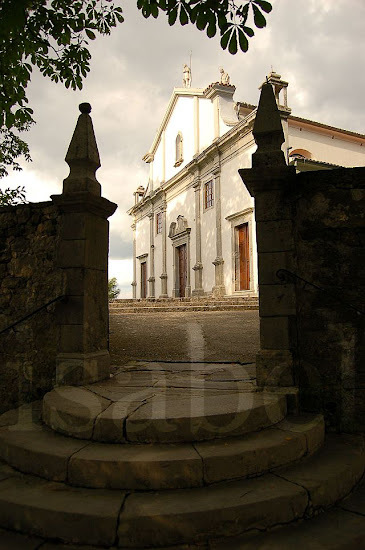 Gracisce is among the most interesting medieval towns in the Istrian hinterland. It was one of the most important and developed Istrian town in the Austrian part of Istria. wow I am going visit Gracisce to show my kids my family roots...looking sooo forward to it!!! To see more pictures of Gracisce, click on ''This is what I see' in the right column. I'll also inevitably be posting more pictures in future posts, so do come to this window again! Sorry, click on 'Gracisce' in the 'This is what I see' section in the right sidebar.